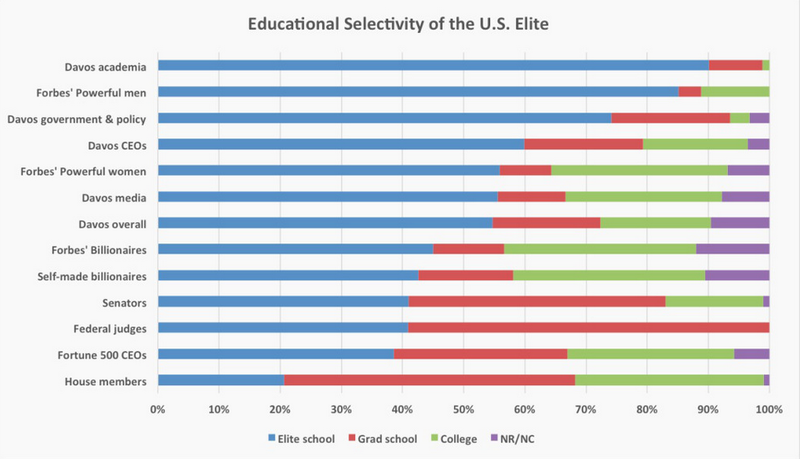 Jonathan Wai writes in Quartz about returns to elite education in the US. Wai also notes that more than ten percent of all Senators, billionaires, Federal judges, and Fortune 500 CEOs hold Harvard degrees of some kind. See also Credentialism and elite performance, and further links therein. Blue = attended elite undergraduate college or graduate school (no more than ~few percent of US population, so highly overrepresented in the groups listed above). Red = earned a graduate degree but did not attend elite school. Green = earned an undergraduate degree but not in either category above. These schools simply select for high general ability. That is why they produce a disproportionate number of the power elite. In other words, the kids are what make the schools great--not the other way around. The proof is that so many who drop out after a year or two at Harvard or are rejected (but have equivalently high credentials) still go on to great things--like Mark Zuckerberg or Bill Gates. I'm also reminded of Hun Loo Gong, who was rejected by Harvard and ended up going to Lincoln College in Pennsylvania. He then designed a chip that was compatible with both iOS and MS-DOS, founded a company to manufacture it, and became a billionaire. His story was written up in the press a few years ago when he announced plans to--get this--found a new university. Hun Loo Gong, who was rejected by Harvard ... "
For specific Harvard percentages for the graph above: Davos overall: 18.5%, Forbes' powerful women: 18.6%, Forbes' powerful men: 40.7%! Interesting observation. Do you think prestige accounts for the Harvard effect (i.e., getting noticed for simply having gone to Harvard)? True, some other places like Stanford, Yale, etc. are very prestigious as well. But the drop-off in prestige seems steep, especially for non-academic business audiences. Facilitating social connections seems very important as well. Stanford, Yale etc have a big cachet with Wall Street and the big management consulting firms like Mckinsey, Bain, Accenture etc. It makes perfect sense. Admission to, and graduation from, Harvard is not a 100% error-free process (some people on the borderline will tip into admission, and some will tip out), and to some extent the randomness in admission & graduation forms a natural experiment; by comparing the groups, you get some idea of the casual effect of going to Harvard. Thanks for that. I responded before reading your reply. Yours is better. Yes, that seems correct. Harvard is good at facilitating connections--probably better than other schools. That's a good point about the drop-off in prestige--most in the business world probably know little of what goes on (or does not go on) in college classes, and simply fixate on Harvard's name. If you compare the population of students accepted at Harvard to those who were rejected on your criteria of metrics which indicate "ability", would they be identical? Why does the population have to be identical? Obviously, a lot of losers apply to Harvard and are easily rejected. They make the group of rejects look below-average. But 'gwern' put it best: Harvard can only accept a tiny percentage of those who could perform well at Harvard, leaving thousands of applicants who are equally high-scoring or even higher-scoring, with research papers or published poetry to their name. And that's assuming Harvard uses objective admissions and does not employ targets (quotas)--which is far from the reality: As Steve Pinker observes, Harvard picks up a lot of people who really can't do the work--legacies, rich kids from fancy schools--people who displace those who go on to found tech firms or write novels. By the way, I'm not knocking Harvard or Ivies--it's just that there are thousands of people who don't get in who could also excel in Harvard course work, given the chance, and outperform their peers who do go to the big H--that is what is meant by equally qualified. This is historically true, so you are correct--Ivy Leagues have long sought rich kids to curry the financial favor of their parents/family, and these kids have the connections at the ready even if they flunk (get a "Gentleman's C) their classes at Yale. But one does not have to be super-rich to get in--being a legacy applicant significantly improves one's chances of admission, and one's family need not be particularly wealthy to harness this advantage. These legacy families also enjoy the connections that give their kids a leg-up in the business/financial world. But if you discount the super-rich and legacies, my sense is that there are more CEO and founders of top companies and more top researchers and academics from Harvard and Columbia than State, relative to the size of their respective undergrad populations. This is especially true today in the tech world: just think of how many self-made founders went to elite colleges--Zuckerberg, Gates, and Hsieh (Facebook, Microsoft, Zappos) from Harvard; Filo and Yang (Yahoo) from Stanford. Even Steve Jobs went to Reed, a top liberal arts school, while Wozniak (Apple) went to Berkeley. I think this is what Jonathan Wai is trying to get at. The statement of yours that kicked off this whole exchange was your claim that even Harvard rejects go on to do great things. I pointed out that your logic is a bit off because it doesn't make sense to claim that rejects are of high ability. IF Harvard has an ability filter, you can legitimately claim that making it into Harvard is a good indication of ability. However, getting rejected is not. You may or may not be of high ability if you are rejected, but you cannot say more than that logically. You even make that point when you claim that the low ability rejects "make the group of rejects look below-average" but then you continue as if you never make that point. By the way, I don't think that most Harvard graduates go on to found tech firms or write novels. I suspect most of them are doing low-risk things like work at law firms, financial firms, consulting companies etc. Harvard tends to select for people who are exceptionally smart, exceptionally ambitious, exceptionally hardworking, exceptionally well rounded, and come from exceptionally rich, powerful and prestigious families. If you had a control group of people who were equally selected on all those traits but didn't attend Harvard, I suspect they would be exceptionally successful in life too. This is pretty much what I say in the response to Cornelius, above, that I posted yesterday. Yes, Harvard provides connections that are priceless (well, not literally, since wealthy families pay to play by becoming donors), but if you discount the super-rich and well-connected, you would likely find that the average Harvard alum is much more accomplished than the average alum from State. In fact, because applicants from poorer families with zero political connections have to outdo their rich counterparts, it is likely that they are more accomplished in all areas except, say, being executives at established investment and finance houses where who you know matter as much as what you know. "You may or may not be of high ability if you are rejected.." Never said that getting rejected is itself an indication of ability. All I said is that there are MANY people who are rejected who had equally high credentials. Both Gwern and Pumpkinperson have noted this. And, they use this point to say that such high-ability people--who didn't attend Harvard--go on to comparable achievements. The point is that Harvard doesn't "make" these people, except for a small group of outliers with wealthy parents and the attendant connections. "You cannot say more than that logically..." Sure, if you were from rural Mongolia and knew nothing else about the American admissions process. But we do know a lot about this from experience: lots of high-ability people get rejected or don't even apply--everyone knows these people, and Harvard will even say they cannot take every qualified kid who applies--they only have so many spots after all! That's both because Harvard can't take everyone who's qualified, and because the system isn't perfect: Steve Pinker even called Harvard's scheme "eye-of-newt-wing-of-bat". Finally, the point about the low-ability rejects was to address your question, Is the pop of admits the same as the pop of rejects? Of course not, because there are a lot of low-quality people who apply for no other reason than it's Harvard. Nor does it matter, because it doesn't change the fact that there are literally thousands of kids with perfect scores who are rejected. Those are the people that I--and Gwern and Pumpkinperson--are referring to. The people we know were rejected but are equally qualified. So, your question is the wrong one to ask. Why don't you answer Gwern's rebuttal (It makes perfect sense. Admission to....) below. It encapsulates all of this. Oh, on your last point on what most Harvard grads do: Of course. 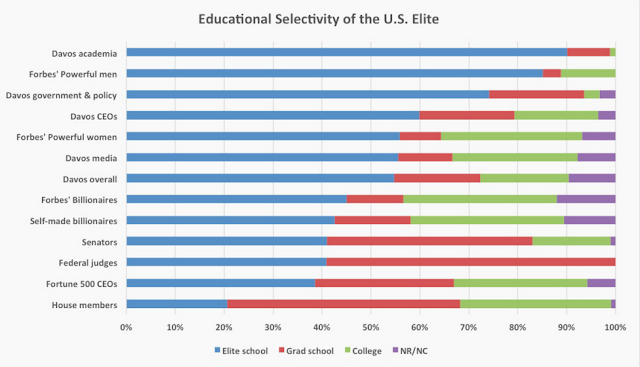 Few people in general do things like found tech firms or write novels, but there are a higher proportion of highly accomplished people from elite schools than from others. But it's not about the elite school: elsewhere, Wai and colleagues from Vanderbilt have noted that it's standardized scores that predict for outsize accomplishments not just in business and academia but in the arts and letters. This work was referenced by Steve Pinker recently when he point out flaws in Harvard's admissions--basically, he's telling his own school, "You're rejecting so many well-qualified applicants!" Exactly my point! So there you go. Pinker knows there are a lot of poorly-qualified rejects, but that doesn't change the fact that there are so many well-qualified and better-qualified rejects that Harvard's throwing out. These people are NOT not-qualified by definition of being a reject. And again, we CAN say something about many of the people H rejects because of something called 'experience'; you are fixating on a definition of 'reject' that defies this. That's why Pinker wants to improve the process. HS, go ahead and look at Gwern's post and reply, but it's time to move on to other Hsu posts. It would be very interesting Dr Hsu, if we could get stats on what area of study or academic field these people study in school. Putting aside, sorting effects of certain personality/social capital types doing the same courses as others, I would like to know what sorts of knowledge and fundamentally, what types of thinking and intelligence equate to success as it relates to 'book learnin' as our brothers in America say.